We have some news to share today -- SketchUp 2015 is available for download now -- but first we’d like to share something that’s a few weeks old. Thank you for replying to my mum. I'm Marius and I'm 8 years old. I really like SketchUp and we have it in school. In art school, I made a factory with my best friend. I'm a detective for the Ottawa Police Service. I specialize in Bloodstain Pattern Analysis and was introduced to your software while collaborating with university students. Using online tutorials I was able to quickly create 3D plan drawings for our crime scenes. The quality of the visual evidence produced was above and beyond what our court system was used to. We get emails like these all the time, and we always think it’s incredible that so many different kinds of people can learn and be productive with SketchUp almost right away. On the other side of the spectrum, we regularly hear from seasoned modelers who have mastered SketchUp to make building things more efficient. We’re incredibly proud that SketchUp helps all of these people be successful -- and have some fun while they’re at it. So when we plan updates, our team feels a big responsibility to preserve the reliability and flexibility that makes SketchUp... well, SketchUp. In this release, we turned our focus to upgrading SketchUp’s performance infrastructure. In particular, we’ve updated SketchUp, LayOut, and our Ruby API to run as 64-bit applications. The least nerdy way to explain this change is that 64-bit architecture allows SketchUp to take advantage of more of your computer’s active memory. We’ve moved to 64-bit both to improve performance, but also to set up SketchUp to work better with the operating systems and extensions that people will be using over the next few years. So while this is a big modification to SketchUp’s technical backbone, we kind of hope you won’t notice it at all. Similarly, SketchUp 2015 includes new modeling and documentation tools that we designed to feel like you’ve been using them for years. Probably our favorite of these is the Rotated Rectangle tool, a way draw to axis-independent rectangles that’s both incredibly useful and surprisingly intuitive. Give it a try: we think it will remind you of the first time you used SketchUp. 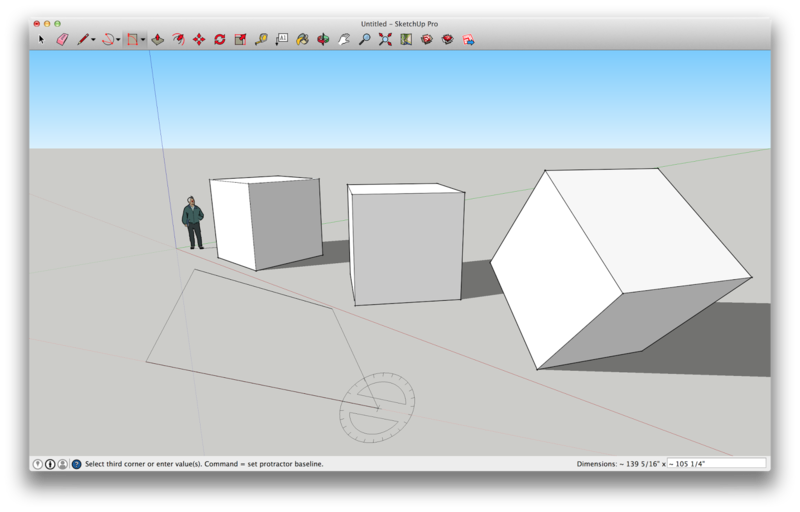 SketchUp 2015's official Rotated Rectangle Tool draws rectangles that don’t have to be perpendicular or parallel to an axes. It’s a simple idea that saves you about a dozen clicks to draw shapes like the cube on the right. There’s a lot more to explore in SketchUp 2015: fast styles... LayOut smart labels... a 3 Point Arc tool... simpler Pro licensing… full IFC compatibility to get more and more folks participating in information modeling… we’ve even linked SketchUp to Trimble Connect, a new collaboration platform for sharing, reviewing, and commenting on any kind of project file. You can download our latest version here, and if you have SketchUp Pro License, go ahead and use our license wizard to upgrade. If you work in SketchUp every day, we think you’ll really love this release -- after all, all we’ve done is make SketchUp work more like… well, SketchUp. I love SketchUp, I use it all the time! Any plans for a ChromeOS version of SketchUp in the future? Thanks! Totally surprised - didn't see this coming today. Thanks for improving our favourite modelling tool further. I personally am only concerned whether I can use my favourite plug-ins in the 64-bit version of Sketchup. Otherwise, I'll roll with the punches. Last year we got new icons, this year we get 1 new tool for Sketchup, and 0.5 new tool for Layout. If trimble wants to compete with big CAD and BIM applications they will need to hire peoples to complete the 2 ketchup's team staff, that the only explanation i got for such LOW update 2 years in a row. @N1KO: Thanks for your comment and feedback. We hope you've also noticed that in the last 18 months we've released three updates for SketchUp, that have been accompanied by three new web properties that you can use with SketchUp (Extension Warehouse, an entirely new 3D Warehouse, and Trimble Connect). There's also about 300 extensions in Extension Warehouse that we've reviewed and QA'd with the developers who wrote them. To your point, we don't want SketchUp to feel like a "big BIM" application that is full of buttons you don't understand, so we'll probably never jam features into SketchUp just to make it feel like another software program. And we'll also never charge you for SketchUp the way other companies do. And we're proud of that too! Hi, Very glad to see the 64bit support which allows more RAM usage. Does it also take advantage of dual processors now or still just one processor? Thanks.